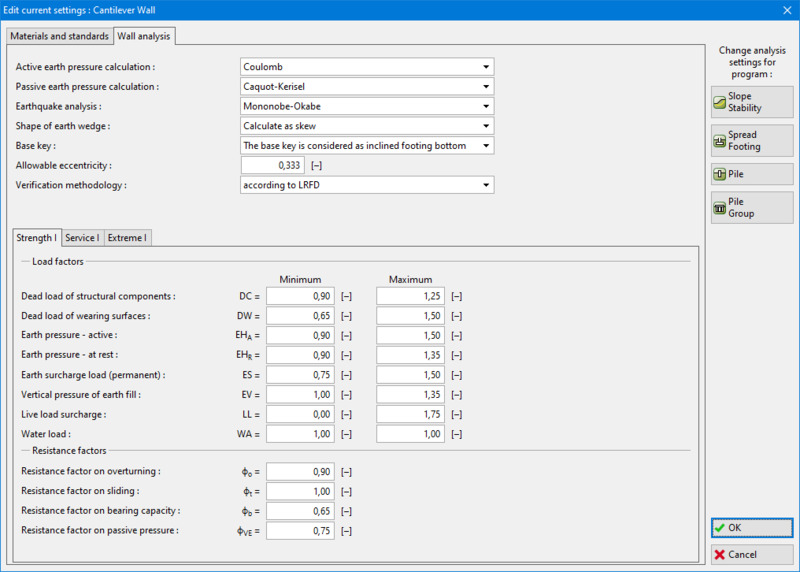 Analysis according to LRFD introduces two types of design coefficients - coefficients modifying the load magnitude (Load factors) and coefficients reducing the soil resistance (Resistance factors). These coefficients enter the analysis according to the selected design situation. When evaluating individual cases of failure, the program determines, whether the force or pressure acts favorably or unfavorably. It is then multiplied by the corresponding partial factor. When performing the final verification the overall resistance of the structure against failure is multiplied by the corresponding resistance factor. For support structures (walls), the information about the applied design factors are provided in the analysis protocol.